See the screenshot attached. Norton is finding a serious threat and deleting the downloaded file. 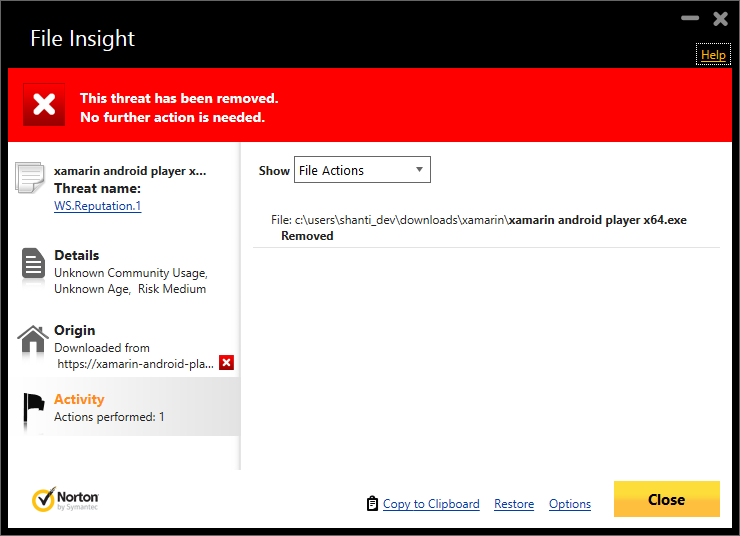 This probably means that someone reported this as a threat at some point, or maybe Norton, just shows this false positive when it does not have any data about an executable. Then what is the work around if not a solution? Uninstall Norton and install a proper AV solution? Or temporarily disable it while installing. Norton uses a Reputation system for files that it does not know. If they are not that common then things that have nothing wrong can be reported as if they have a virus. You can send a report to Norton to have this one put on the list. As for a proper AV solution, I would trust Norton over most others, especially the one that Mr Cheese is using.